NYPD police officer Nguyen, 30 years of age, was listed in stable condition at Jamaica Hospital Medical Center after an occurrence in the Brooklyn neighborhood of Cypress Hills. 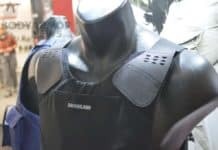 There is no doubt that his ballistic resistant vest saved his life. He was shot in the arm and twice in his bulletproof vest after responding to the pleas of the assailant’s mother. 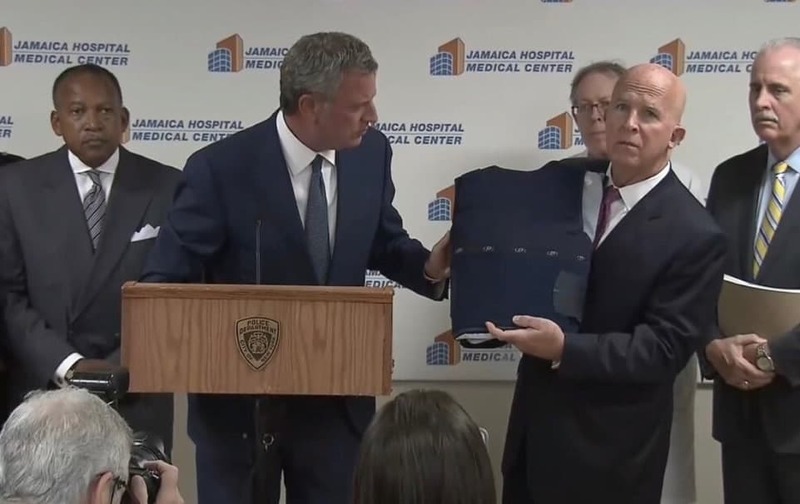 New York Police Commission, James O’Neill displayed the damaged vest during a news conference with other police officers and the Mayor of NYC, Bill de Blasio. The Mayor told the press that this was another occurrence of police officers going into dangerous situations and not knowing what will happen from one moment to another. The assailant, identified as Andy Sookdeo, was described as emotionally disturbed by his mother who placed the call to 911 at approximately 4:35 p.m. The 29-year-old man’s mother said she did not believe he was armed or violent. Officer Nguyen and fellow officers from the 75th precinct responded to the call, coming out to her residence in Brooklyn. Officer Nguyen and another officer were allowed into the home along with the city’s Fire Department Emergency Medical Service personnel. Sookdeo’s mother feared her son would escape out the back door of the home so another officer went to the back of the building. Meanwhile, Nguyen and EMS entered a bedroom in the rear of the building. The man inside the bedroom fired at Officer Nguyen as he approached the room, hitting him once in the arm and twice in his body armor. Nguyen managed to retreat from the bedroom and leave the premises without returning fire. The EMS team immediately treated the officer and then transported him to the nearest hospital. Andy Sookdeo remained in the bedroom after the shooting. There was a standoff for approximately one-hour when the police officers entered the room and found the man dead with two weapons nearby. Relatives told the media that Sookdeo lived with his parents and never showed signs of violence. The young man was identified as Andy Sookdeo by the New York Daily News and other local news medias. This is another example of NYPD officers going into unpredictable situations and how ballistic resistant vests and body armor have protected and saves the lives of these brave police officers. Violence is on the rise in many cities around the United States as well as throughout Europe. Police officers face dangerous situations and they need and deserve the very best protection when performing their jobs. 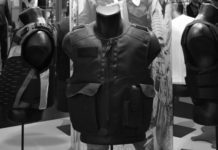 Bulletproof vests, ballistic resistant vests, and body armor are designed with the highest technology to save their lives. Every police officer should have access to the latest and best armor every single day.